Since one of the best experiences of traveling to any new place is trying the local food, when we landed in Copenhagen and saw in every window and on every sidewalk menu that we passed the advertising of Smørrebrød we figured we should give it a try. After all we had never heard of it and it had so many o’s with dashes through it that it had to be good. And as it turns out, if you are looking for a traditional Danish food experience you need look no further than this delicious open-faced sandwich. Smørrebrød, pronounced something like SMUHR–bruth, although literally meaning “buttered bread”, is an artistically crafted open-faced sandwich and is the staple of any frokost in Denmark. A meal of Smørrebrød consists of several different variations of this “sandwich” and is traditionally made on sourdough rye bread. 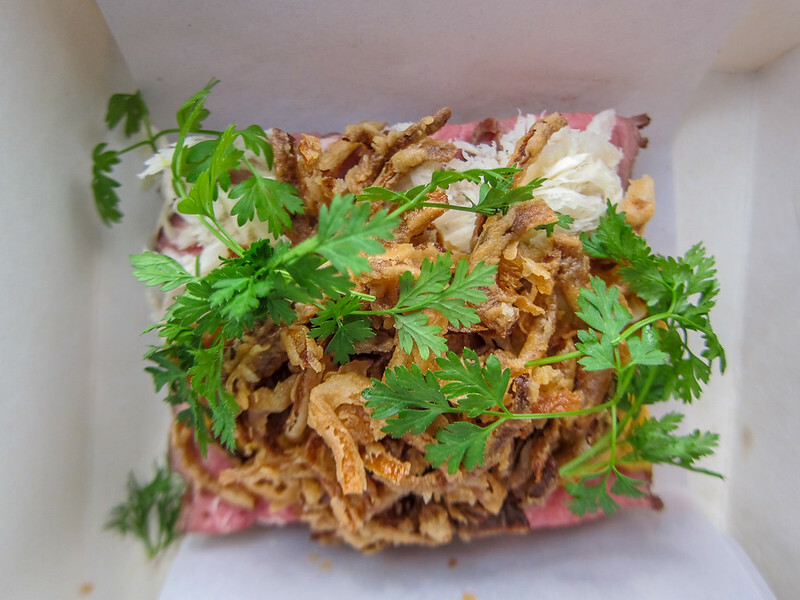 The bread is smeared with either butter or duck fat, and covered in toppings, or pålæg, ranging from meat to seafood, eggs and cheeses, which are prepared sliced, roasted, fried, smoked, scrambled, raw or whatever other way the server sees fit. A final pyntet of garnishes covers it all. Each topping and corresponding garnish gets its own piece of bread, each making up a separate sandwich, each eaten in the specific order mentioned above. Complement with some Danish beer, and just like that, you’re eating Smørrebrød like a true Dane. Velbekomme! According to our Rough Guide to Europe the place to go for some proper Smørrebrød was Aamanns. After taking, in my opinion, what was the nicest walk in Copenhagen through Kongens Have park to the southeast corner of Østre Anlæg, we came upon this out of the way restaurant/deli. Based on the obvious lack of tourists and over abundance of locals going about their Danish business we were at once both slightly intimidated and quite pleased with the choice. We opted for the deli, which is on the right side of the restaurant through the glass door marked “Take Away” and up the stairs. Following the suggestion of the helpful person behind the counter we soon walked back out carrying our very own fish and meat Smørrebrød in a nicely prepared box. Being an American the very nature of an open-faced sandwich seems a little unnatural, and more often than not the thought of one conjures up images of a sloppy smorgasbord of gravy doused turkey and soggy bread. So when we first opened the take away box containing the Smørrebrød we ordered it was quite a surprise to find two fancy looking salads inside. To say the least it was delicious. 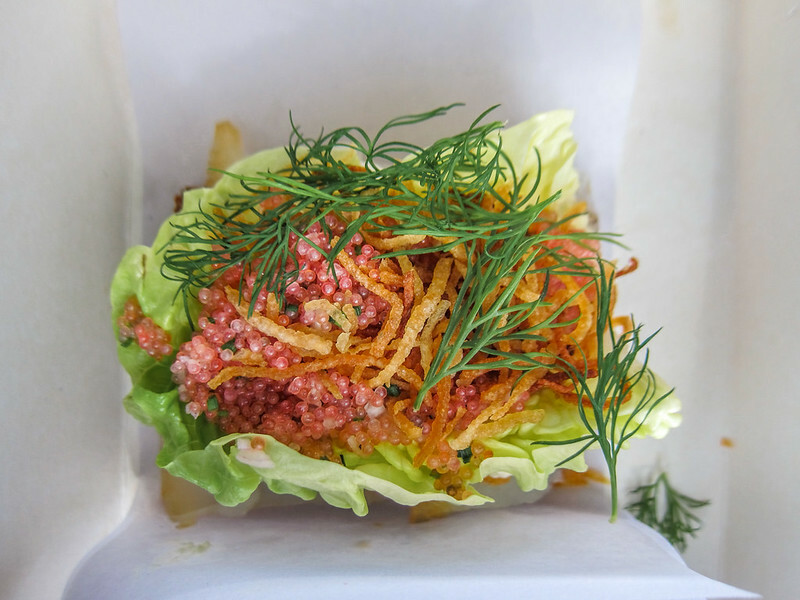 We tried to eat it as slowly as possible so it could last as long as possible and when all was said and done Copenhagen’s Smørrebrød easily gave Stockholm’s bottomless fish soup a run for its money as our favorite Scandinavian food experience. And it turns out we don’t have to travel all the way to Copenhagen to get our fix of nordic cuisine since Café Smörgås in Paris serves up the Swedish version near the Canal St. Martin. Or when we find ourselves back in New York we can try The Copenhagen in TriBeCa for about as close as you can get to eating like a true Dane outside Denmark. Of course, nothing beats getting it from the source, and the lesson learned here is that whenever traveling in a foreign place and a particular food is advertised everywhere you go, you are best to try it, especially if you can’t pronounce its name. Just make sure you eat it right.